In The Door: This is SO much better than LinkedIn! In a tough job market, your ability to work your network is key to finding a job, and in today's world, that happens online. In the past, the best site for job contacts was LinkedIn.com. Have I ever mentioned that I find Linked-In(or is it LinkedIn? LinkedIN?) annoying. For one thing, I'm never sure the proper way to spell it, and it doesn't "look" right no matter how you do. For another, it's so complicated, and I find it counter-intuitive. It requires you to put all of your contacts into categories that they really may or may not "fit" in. For example, most of the people I've met over the years who are likely to help me find work are not people I've actually worked with. They are people I've met at conventions or online, and this type of connection is not even recognized on LinkedIn. For another, you get to "know" people by socializing, and LinkedIn is not good for that - it's "all business," which for me ends up being "no business." Apparently, I'm not the only one. The folks at a new start-up, called "In the Door" figured out a workable solution. It's a Facebook App that meshes your Facebook friends' employers with Indeed.com's job listings. 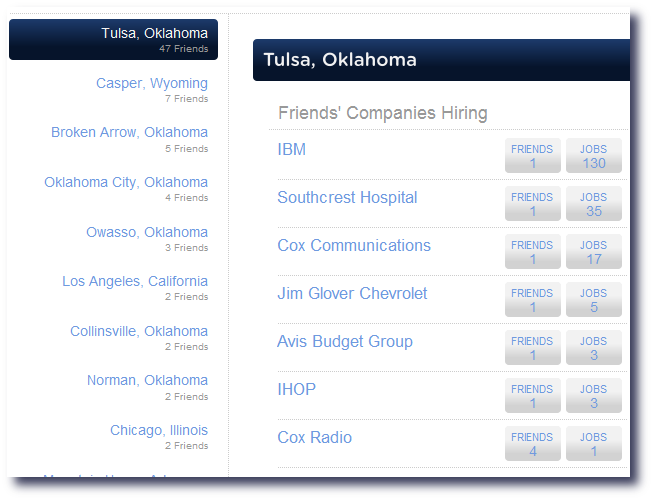 With just a few clicks, you can easily view a list of job openings at the companies where your Facebook friends work (i.e., where you already have connections). To try it out, sign in to Facebook, then go to InTheDoor.com, and follow the instructions. Within a couple of minutes, you'll have a list of your friends and their employers sorted by location, as well as how many jobs are listed at each employer. Clicking on the number of jobs gives you a list of job openings at that employer, and clicking on each job opening gives you a brief description of the job with a link to the full listing Indeed.com (a job search engine that compiles listings from many online job sites).